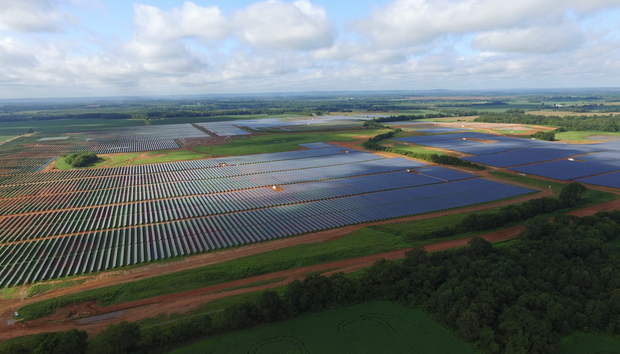 The Tennessee Valley Authority (TVA) today commissioned Alabama's largest solar energy project -- the River Bend Solar Energy Center -- which will eventually generate 75 million watts (megawatts, or MW) of electricity. The River Bend Solar Energy Center will have more than 300,000 solar panels that sit atop motorized platforms that can track the sun from east to west each day to maximize energy production. Once up and running, the solar farm will be able to produce enough energy to power more than 15,000 homes. The energy will serve TVA consumers starting this year, under a 20-year power purchase agreement between government and NextEra Energy Resources, which will run the solar farm. The renewable energy will also eliminate about 105,000 tons of carbon dioxide emissions every year; this would have been produced if the electricity had been generated using fossil fuels, such as more typical coal-fired generators. The River Bend Solar Energy Center will be constructed in Lauderdale County on the border of Tennessee in the northwestern part of the state. The solar farm is expected to create about 350 jobs during the construction phase, with most of the workers coming from the local area. "This... project helps us meet our commitment to provide the 9 million people of the Tennessee Valley with reliable, low-cost, carbon-free electricity," said Van Wardlaw, executive vice president of external relations for TVA. "Over the next 20 years, TVA will invest about $8 billion to support our renewable energy portfolio, and we see a bright renewable energy future for projects like this across the Tennessee Valley."